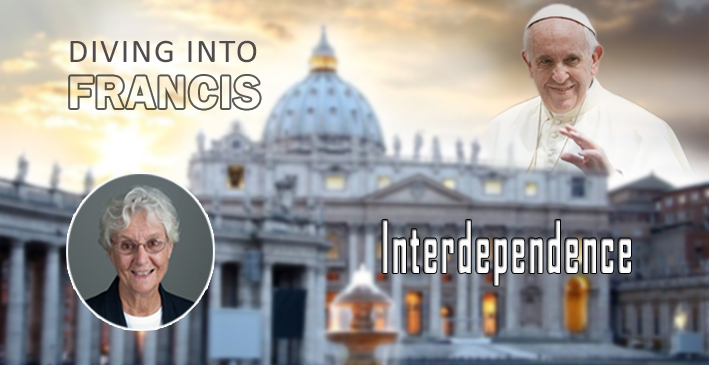 In this third of a series entitled Diving into Francis, Sr. Dianne Bergant, CSA, reviews the three themes of Pope Francis in Laudato Si, namely 1) Anthropology 2) Interconnectedness and 3) Interdependence. In this program, Sr. Dianne explains the meaning of metaphor and how it applies to the flood as found in the Book of Genesis. She explains that the point is not if it really happened. The essence of the story is the covenant that God made through Noah. She then speaks of the covenant with Abraham and the ritual of sealing the covenant. The partners make a serious promise to keep the covenant. With Noah, God initiates the covenant. The partners of the covenant are God and the physical world, not just Noah. All are connected on a spiritual level. 4.) Our website (www.wordnettv.net) 24/7. Watch INTERDEPENDANCE now by CLICKING HERE! Roku, and Amazon Fire TV. Amazon supports us; won't YOU? YOU shop and AMAZON donates. To Wordnet!! Amazon-Smile has contributed $69,949,133.28 to Charities. Wordnet with your help has received $528.11 to date. Shop for GOODNESS sake!! Thank you! … we’ve got a small favor to ask. Wordnet's independent sharing of God's Word takes a lot of time, money and hard work to produce despite the fact that all presenters do it gratis. But we do it because we believe communicating the Word of God matters – because it might well be your belief too. If everyone who watches these daily meditations will help to support it for as little as one $ a day these messages will continue to a world hungry for the word of God.